Commitment, whether we are dedicated to a cause, an activity, or loyal to another, is still a bond that is hard to maintain. Commitment takes a lot of work. It takes discipline, dedication, and motivation. It takes perseverance and a strong desire to see it through completion. It takes sweat, it takes tears, and often it takes the courage to stand alone. The discipline of commitment is much greater than the up and down ride of motivation. Motivation will get you started, but commitment will bring completion. Whatever needs to be done in your life, don’t wait on motivation…commit to it and watch the change. There are a lot more people who start than finish. The difference in the starting and the finishing line is COMMITMENT!!! Let this be the moment when the need is greater than the feeling. Finish the book…complete the song…end the campaign…go back to school…put on the running shoes and whatever else is lying undone in your life. His words hit home in so many areas of my life. Immediately, I knew I needed to pick up the manuscript that has been serving as a coaster on my coffee table. I also knew I needed to dig out the tennis shoes and wrap up this exercise hiatus I have currently taken for the last six weeks. Most importantly, I also realized I need to hit “send” on the draft email holding painful, powerful, and challenging words to a person that needs to hear them more than ever. 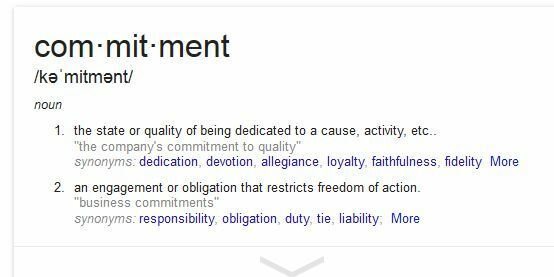 I have made a commitment to this person and many times I have tried to break that commitment. It’s been very hard. It has been emotionally and financially draining. No matter how many times I have tried to run away, I’ve always turned back. I remembered the commitment and why I made it. I have committed to see this person fight his internal demons and close the ugly chapter to his past once and for all. I have committed to endure the heartache, the disappointment, the empty promises, and the lies because I know the man he was created to be, not the man the world altered – the man who you see. As my finger sits heavy on the mouse, hesitating to release the saturated email, I am reminded of my Pastor’s words. This need to help my friend see the truth, is greater than the fear that I am feeling. It is greater than the risk of losing him. It is greater than the heartbreak I may encounter. Whatever is lost by my next course of action, pales in comparison to what I have gained. I have found personal love, messy love, whole love, and broken love. I have loved through the darkness of another human being. I am no longer striving towards love. I am love.